Shiv Kumar and his father Ramkripal Agarwal, who live in Semaria village of Bhatapara used to practice traditional farming and produce vegetables in 13 acres of land. But now their main business has been dairy farming. In order to feed the green fodder to the cows, they have been cultivating it over five acres of land for a year now. At present, they have 110 cows, which produces 600 liters of milk, and they sell it at a rate of 35 Rupees per liter and earn 2100 Rupees per day from it. Now they wish to increase their dairy business and want to take it to better heights. Shiv Kumar said that since 1982, they have been working hard on about 13 acres of farmland. Initially they practiced traditional farming and used to produce paddy, gram, wheat etc. Now they also produce vegetables. From the income that they earned from this, they bought four cows in 1990 and started a dairy business under the name of Agarwal Dairy Farm. To increase the consistently improving income, they reached out to the Veterinary Department and sought guidance from them. By purchasing 6 additional animals in the year 1994-95, they made milk production as their primary business and started producing approximately 60 to 70 liters of milk per day. Their interest in the production of milk increased and they could see it turn into the main source of their income. After receiving necessary guidance from the Veterinary Department, they concentrated on the improvement of their breed. With immunization and nutritious diet, the production of milk from healthy cattle increased drastically. Around the year 2002, they started yielding 150 liters of milk every day. Increased profits in 2003 lead them towards artificial insemination of the cattle for the improvement of the animal breed. Female calves born from artificial insemination were provided with adequate food and special attention was given to their upbringing. As a result, today they have 110 cattle, out of which, 101 are bovine and the other 9 are buffalo ancestral. 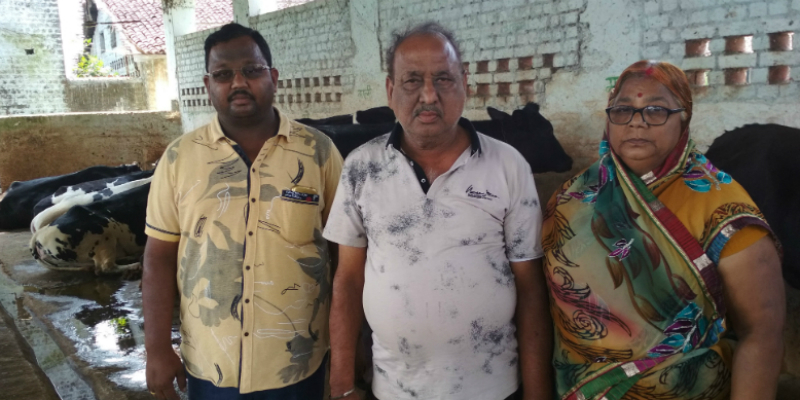 Today, Shiv Kumar Agarwal is not only selling milk but from time to time, he is also earning an additional profit by selling about 8 to 10 animals per year. They prepare mixed balanced animal food themselves and serve it to the cattle. Apart from this, they never let the green fodder to finish. They are also using advanced technology in dairy products as well as vegetable production and agricultural activities. The success story of Shiv Kumar and his father is an inspiration for a lot of people today. It would be relevant to mention here that milk production of private and organised dairy farms in Bhatapara development block is 4,335 liters per day and 1,34,385 liters per month. In this business, 41 dairy farm owners of Dhabadi, Khokhali, Semaria, Taranga, Dhurra Bandha, Gudalia and Kadar are connected. They have 341 HF crosses, 262 Murrah, 172 gir, 61 jerseys, 56 Haryana, 55 Sahiwal and 354 other cows. Together, there are a total of 1301 animals.